Fort Defiance—once a Union military camp, now an afterthought of a state park—defies nothing. The landscape is passive, rigid, and unremarkable. The green rectangle does not reveal or engage its significance as the confluence of two of North America’s most ‘mighty rivers.’ This makes Fort Defiance State Park an ideal site for challenging landscape ideas such as the park, the memorial, the river economy, the political boundary, and the site itself. The studio will situate this regional landscape in a global context, understanding ‘site’ as a confluence of global flows. The Mississippi River is a system of confluences. From the headwaters in Minnesota, the river encounters and combines its 167-odd tributaries as it meanders 2320 miles to the Gulf of Mexico. The watershed spans from the Rockies to the Appalachian Mountains, connecting Three Forks, Montana to Pittsburgh, Pennsylvania. Humans have further connected the Mississippi River—through portages and canals—to the Great Lakes and the Atlantic Ocean. The river system supported thousands of years of human settlement before it became strategic in the colonization of North America and essential in the establishment of early US American settlement and trade patterns. Though railroads and highways superseded river trade in the 19th and 20th centuries, the river system still sees more than 500 million tons of shipped goods per year, connecting the Mississippi to the rest of the world. [C]ontexts imply other contexts, so that each context implies a global network of contexts. —Arjun Appadurai, Modernity at Large (187). Our confluence site—the mingling of the Mississippi and Ohio Rivers—implies other confluences. The studio therefore asks students to understand a site in terms of its nested hinterlands. Thus, we study ecological, cultural, and economic flows throughout the river system and over time. In order to speculate about the future of this complex assemblage, we investigate the site in terms of global trends. We drift down river roads, from Grafton to New Orleans, contemplating shifting patterns of migration, production, trade, and ideology along the river. Drift materials serve as evidence of the hinterland, and students employ found materials to study the production of space in an implicated landscape. Each student discovers something of the global in the local and uses their findings to adjust the mode of landscape production at Fort Defiance State Park. The studio challenges the static, pastoral landscape, and students will project futures for the park which are productive, contingent, and perhaps even defiant. 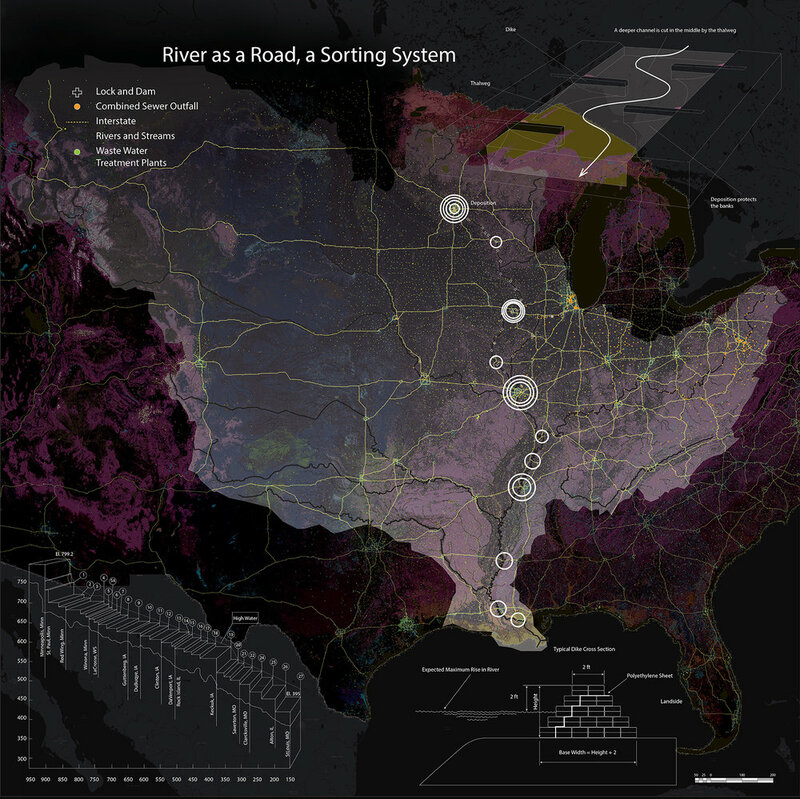 Initially, the studio asked the students to think of the Mississippi River basin as the site. to study in concert. The Mapping and the Field Notes portion of the semester aim to focus on the overlaying of the selected pair of processes, in order to discover productive harmonies and dissonances. The students then studied how their research might intersect the studio site—Fort Defiance State Park. On the trip our aims were to understand the constructed river, its history, its industries, and its settlement patterns. We visited river control structures, such as Old River Control and the Bonnet Carre Spillway. We passed miles and miles of corn, soybeans, and cotton. We explored the blurred boundaries between land and water, taking note of the material ecologies we trudged through, parsed apart, and picked through. Each student found some drift material of interest, helping them to find evidence of one of the processes they were interested in from the initial Mississippi research. The trip helped students to clarify their maps, develop their Field Notes Study drawings, and instigate their Drift Model studies. We spent time on our Fort Defiance State Park site at the Ohio/Mississippi Rivers Confluence, but we looked as closely at the rest of the Mississippi River as we did to our site of intervention. The Field Notes Study drawing series asked the students to photograph, draw, and construct responses to the varied river edge throughout the sites we visited on the trip. The drawings helped the students to take interest in human and nonhuman processes, which in turn helped them develop their hybrid (human and non-human) ‘confluence lens’ for further research and design speculation. On the road trip, the students were also asked to pick up drift material from the river, considering where it came from and what landscape processes from near and far are implied in this material ecology. Natia Kapanadze, wood, wheat straw, found mesh, Doritos package, corn, watercolor. Drift Model shows how levees keep river water out of floodplain industrial cropland, but leach nutrients into the Mississippi River. Lauren McDaniel, driftwood, bones, fern, soil, plexiglass, and nails. Drift Model depicts strip mining site preparation on top, and studies decomposition in real time inside the terrarium. After making an initial proposition for the studio site, the students studied their industrial and ecological processes of interest through a time-based work. We made an immersive panorama out of photographs from the Ohio and Mississippi Rivers Confluence. Inside the panorama, students projected video works which tested their site-based propositions, deepened their understanding of landscape processes, or made propaganda for their proposals. Seven students chose to work in video and animation. One student chose to study through a landscape performance documented through photographs, and one student chose to develop research by interacting with people in the gallery. Student Simiya Sidduth reads from her Mississippi Tarot card deck to Rory Thibault. Work on the wall by student Virginia Eckinger (left series of 5) and confluence image and other drone photographs (right) by invited artist Aaron Owens. Student Natia Kapanadze, stop-motion animation over Mississippi Panorama. Based on their ‘confluence lens’—the consideration of the layering of human and nonhuman systems throughout the Mississippi River system—each student developed an intervention for Ft. Defiance State Park. The park, managed by the Illinois Department of Natural Resources, is underfunded, floods about once per year, and despite the mud and the often unmaintained roads sees many visitors for the confluence of the Mississippi and Ohio Rivers. One student, Virginia Eckinger studied the use of river control structures for transportation by the Army Corps of Engineers, while studying how the river and the human control structures sort material and ecology. Her project proposes to use captured driftwood in compressed dike-like structures to create new landforms along a newly dynamic river edge on the Ohio side of Fort Defiance State Park. Virginia Eckinger, digital drawing projecting the intervention over time in conjunction with flood levels of the Ohio River. 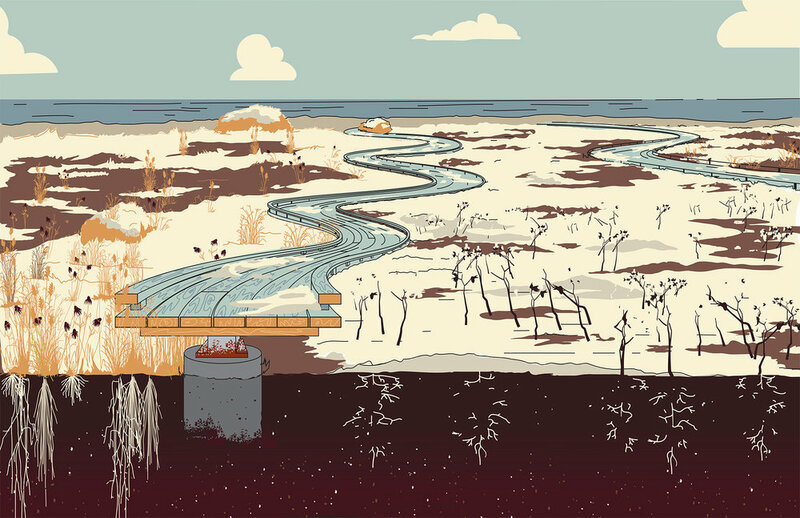 Virginia Eckinger, digital drawings showing the different functions of dikes when positioned differently against water flow. Virginia Eckinger, digital drawing depicting the construction of the river control structures from gathered drift material, and how they will be anchored and situated in the Ohio River. Another student, Dongzhe Tao, studied the larger river control structures, how they make pools in the floodplains, and also studied the potential to utilize algae growth in the system for human uses. Dongzhe’s Fort Defiance State Park is a flood-adaptive and productive landscape which tests various algae production methods for human edibles and energy. Her project also engages recreation, and models the Mississippi River to help people understand the current state of the watershed and its potential futures. Dongzhe Tao, digital drawing showing site conditions, including the potential solar radiation for algae production. Dongzhe Tao, digital drawing of the site intervention. On the west of the site is the algae field cut by a pathway in the shape of the Mississippi River from Ft Defience to the Gulf of Mexico. On the State Park site are floating tanks that produce edible algae as well as bioluminescent algae tubes for site wayfinding. Dongzhe Tao, digital drawing showing experiences and operations. Another student, Simiya Sudduth, focused on the development of the Mississippi Tarot card deck, as a tool to interrogate historical narratives of colonialism, industrialization, human ecology, and individual agents in the Mississippi River system. The tarot deck can be used as a tool to parse apart the layered web of agents in a site, but the deck can also be used as a social engagement tool to discuss the future of a site. For the Ft. Defiance State Park site, Simiya developed two rivers path that cuts through the site, between which a dynamic web of biodiversity is planted and tended through social engagement. The plantings offer tactile experiences with plants that are important to human culture, reintroducing old varieties before the cultivars adaptations focused on mechanization and mass consumption. Simiya Sudduth, digtal drawing of siteplan proposal above. Perspectives of spring, summer, fall, winter, and flood below.